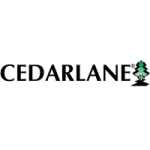 Cedarlane's anti-rat CD90 (Thy 1.1) monoclonal antibody recognizes the Thy 1.1 antigenic determinant on rat as well as mouse cells. This particular determinant has been defined to be monomorphic within rats but polymorphic in the mouse. The OX-7 clone reacts with Thy 1.1 mice (ie. AKR) but not Thy 1.2 mice (ie. CBA, BALB/c). The affinity of the F(ab) fragment of this clone for rat Thy-1.1 is 3 x109 M-1 and for mouse Thy 1.1 is 3 x 108 M-1 (1). The Thy-1.1 antigen is found on a variety of cell types including thymocytes, neuronal cells (mouse, rat) (8), T and immature B cells (rat), breast epithelial cells (rat) (6), and connective tissue (2). OX-7 has been used to determine that the Thy 1.1 molecule is a glycoprotein with 112 amino acids which is homologous to immunoglobulin domains (3). The Thy-1 antigen is found on a diverse range of cell types (4) and thus it can be used as a cell marker. Furthermore, the binding characteristics of OX-7 have been extensively studied (1) and this appears to be an excellent antibody for studying the killing of Thy-1.1 positive tumour cells with Ab-toxin conjugates (5). In addition, OX-7 can be coupled to Sepharose-4B and used to effectively purify mouse Thy 1.1 and rat Thy-1.1 antigens. This clone has also been reported to work in immunohistochemistry (frozen sections). 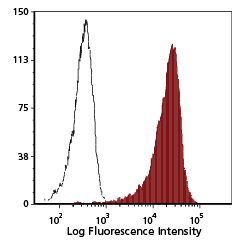 Wistar rat thymocytes (left) and splenocytes (right) were stained with anti-CD90 (clone: OX-7) (filled histogram) or mouse IgG1, k isotype control (open histogram). 1) Mason, D.W. and A.F. Williams. (1980) Biochemical J. 187, 1-20. The Kinetics of antibody binding to membrane antigens in solution and at the cell surface. 2) Campbell, D.G., Gagnon, J. Reid, K.B.M. and A.F. Williams. (1981) Biochemical J. 195, 15-30. Rat brain Thy 1 glycoprotein. 3) Williams, A.F. and J. Gagnon. (1982) Science 216, 696-703. Neuronal cell thy 1 glycoprotein: homology with immunoglobulin. 4) Williams, A.F., Barclay, A.N., Letarte-Muirhead, M. and R.J. Morris. (1976). Coldspring Harbour 5)Symposium on Qualitative Biology. 41, 51-61. Rat Thy 1 antigen from thymus and brain: their tissue distribution, purification and chemical composition. 5) Neville, D.M. and R.J. Youle. (1982) Immunol. Review 62, 75. Monoclonal antibody ricin or ricin-A chain hybrids: kinetic analysis of cell killing for tumour therapy. 6) Dulbecco, R., Bologna, M. and M. Unga. (1979) Proc. Nat'l Acad. Sci. 76, 1948. Role of Thy 1 antigen in the in vitro differentiation of rat mammary cell line. 7) Raff, M.C. (1971) Transplan. Rev. 6, 52-80. 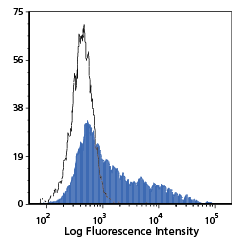 Surface antigenic markers for distinguishing T and B lymphocytes in mice. 8) Barclay, A.N. and H. Hyden. (1978) J. Neurochem. 31, 1375-1391. Localization of the Thy 1 antigen in rat brain and spinal cord by immunofluorescence. 9) Hunt, S.B., Mason, D.W. and A.F. Williams. (1977) Eur. J. Immuno. 7, 817-823. In rat bone marrow thy 1 antigen is present on cells with membrane immunoglobulin and on precursors of peripheral B lymphocytes. 10) Van Dijk A, Naaijkens BA, Jurgens WJ, Nalliah K, et al. (2011) Reduction of infarct size by intravenous injection of uncultured adipose derived stromal cells in a rat model is dependent on the time point of application. Stem Cell Res. 7(3):219-29. 11) Luan X, Ito Y, Dangaria S, Diekwisch TG. (2006) Dental follicle progenitor cell heterogeneity in the developing mouse periodontium. Stem Cells Dev. 15(4):595-608. 12) Laping NJ, Olson BA, Zhu Y. (2001) Identification of a novel nuclear guanosine triphosphate-binding protein differentially expressed in renal disease. J Am Soc Nephrol. 12(5):883-90.